Acyclic unsaturated hydrocarbons containing a carbon-carbon double bond are called alkenes. They are also called olefins since the lower members of this class produce oily products on reaction with halogens such as chlorine and bromine. The σ-bond is formed by head-on overlapping of sp2 hybridized orbitals while the π-bond is formed by lateral or sideways overlapping of the two 2p-orbitals of the two carbon atoms. To have an effective overlap, the p-orbitals move little closer, therefore, a double bond is shorten (134 pm) than a single bond (154 pm). Further, due to poor overlapping between the two p-orbitals, a π-bond is always weaker than a a-bond. Presence of the π-bond makes alkenes behave as a source of loosely held electron. Therefore, alkenes are readily attacked by reagents or compounds which are in search of electrons. Such reagents are called electrophiles or electrophilic reagents. Further, the presence of π-bond makes alkenes less stable and more reactive than alkanes and hence readily change into compounds containing single bonds by adding electrophilic reagents. Ethene and propene can have only structure but alkenes containing four or more carbon atoms can show both position and chain isomerism. carbon atoms. If now one of the carbon atoms of the double bond is rotated with respect to the other, the p-orbitals will no longer overlap and the π bond should break.But the breaking of a π-bond requires 251 kJ mol-1 of energy which is not provided by the collisions of the molecules at room temperature. Consequently, the rotation about a carbon-carbon double bond is not free but is strongly hindered or restricted. A π-bond prevents free rotation of the carbon atoms of the double bond with respect to each other.Due to this hindered rotation, the relative position of atoms or groups attached to the carbon atoms of the double bond get fixed. Many substituted alkenes can exist in two distinct isomers which differ from each other only in the relative position of atoms or groups in space around the double bond. Both these isomers have same structural formulae but differ in the relative arrangement of hydrogen atoms and methyl groups around double bond. The isomer in which the similar atoms or groups lie on the same side of the double bond is called the cis-isomer whereas the isomer in which the similar atoms or groups lie on the opposite sides of double bond is called the trans-isomer. It is because of this reason that geometrical isomerism is also called cis-trans isomerism. Melting points: The melting point of a trans isomer is higher than that of the corresponding cis-isomer. In the trans-isomer , the two similar atoms or groups lie on the opposite sides of the double bond. Therefore, these molecules are symmetrical and hence pack well in the crystal lattice. On the other hand, in the cis- isomer , the two similar atoms or groups lie on the same side of the double bond. Therefore, these molecules are unsymmetrical and hence do not pack well in the crystal lattice. Intermolecular forces of attraction holding the molecules of a trans-isomer in the crystal lattice are much stronger than those holding the molecules of cis isomer. Consequently, the m.p. of a trans-isomer is much higher than that of the corresponding cis- isomer. For example: m.p. of cis-but-2-ene is lower than that of trans-but-2-ene. (2) Solubility: In general, the solubility of a cis- isomer is higher than that of the corresponding trans-isomer. This is due to the reason that the molecules of a cis- isomer being less symmetrical, are weakly held in the crystal lattice than the corresponding more symmetrical trans-isomer. As a result, lesser amount of energy is required to break the crystal lattice of the cis-isomer and consequently the solubility of the cis-isomer is higher as compared to that of the trans-isomer in the same solvent. 3) Dipole moment : cis-isomer of an alkene is found to be more polar than the trans isomer. For Ex: Dipole moment of cis-but-2-ene is 0.33 D while that of trans but-2-ene is zero. Thus trans-2-butene can be said to be non-polar. In cis but-2-ene the dipole moment of two C-CH3 bonds are inclined at an angle of 60° and hence have a resultant equal to 0.33 D. In case of trans-but-2-ene the two dipole moment being equal and opposite cancel out each other and therefore dipole moment of trans-but-2-ene is zero. Trans-pent-2-ene has a finite dipole moment though much smaller than that of the corresponding cis isomer. The dipole moment of C-CH3 and C-CH2CH3 bonds are not equal. These two dipole opposes each other, they do not exactly cancel out each other and hence trans- pent-2-ene has a small but finite dipole moment. 4) Boiling point : The boiling point of cis isomer are higher than those of the trans isomer. Boiling point of isomeric compounds depend upon dipole dipole interaction. Since the cis isomers have higher dipole moment than the corresponding trans isomers therefore the boiling point of cis-isomers are higher than those of their corresponding trans isomers. 1) By partial reduction of alkynes : The catalytic hydrogenation of alkynes to alkenes occurs faster than that of alkenes to alkanes.Since alkynes show geometrical isomerism, alkynes can be reduced to give cis or trans alkene depending upon the nature of catalyst used. For Ex: Catalytic reduction of alkynes in presence of palladium supported over CaCO3 or BaSO4 and partially poisoned by addition of PbCO3 , S or quinoline (Lindlar’s catalyst) gives cis-alkene.If alkynes are reduced with sodium in liquid ammonia(Birch reduction), trans alkenes are the major products. 2) From alkyl halides or haloalkanes : Alkyl halides on heating with a strong base such as sodium ethoxide or a concentrated alcoholic solution of potassium hydroxide undergo dehydrohalogenation to give alkenes. This process of removal of a molecule of halogen halide from a haloalkane to form an alkene is called dehydrohalogenation. Dehydrohalogenation is an example of an elimination reaction. In this reaction a hydrogen is removed from a β-carbon and halogen from the α-carbon ,therefore, it is called β-elimination reaction. Depending upon the structure ,alkyl halides may give one or more isomeric alkenes. For Ex: Dehydrohalogenation of 1-chlorobutane gives only one alkene i.e. but-1-ene since only one type of β-hydrogen is available on the left side of the molecule. The structure of the alkyl halide is such that it has a β-hydrogen on either side of the carbon atom carrying the halogen ,it can undergo elimination in two different ways giving two alkenes. The relative amount of these two alkenes is governed by saytzeff rule. Whenever two alkenes are possible during a dehydrohalogenation reactions ,it is always the more highly substituted alkene (having lesser number of atoms on the double bond) which predominates. 3) From vicinal dihalides or 1,2-dihaloalkanes: Dihalogen derivatives of alkanes in which the two halogen atoms are present on adjacent carbon atoms are called vicinal or 1,2-dihaloalkanes . Alkenes can be prepared by heating a suitable vicinal or 1,2-dihaloalkanes with zinc dust in methanol or ethanol. This process of removal of molecule of halogen(Cl2, Br2, I2) from a dihaloalkane to form an alkene is called dehalogenation. Even 1,1-dihaloalkanes or gem-dihalide also undergo dehalogenation when heated with zinc dust in methanol. If sodium is used instead of zinc, and the reaction is carried out in ether ,only a small amount of propene is formed, the major product being hex-3-ene. This method is not useful for the preparation of alkenes because 1,2-dihaloalkanes are themselves prepared from alkenes. This method is useful for purifying alkenes or for protecting double bond.For this purpose, NaI may be used instead of zinc dust. 4) From monohydric alcohols or alkanols by acidic dehydration: Monohydric alcohols or alkanols containing a β-hydrogen on heating with a mineral acid such as conc H2SO4 or H3PO4 or on passing their vapours over heated alumina at 623-633 K eliminates a molecule of water to form alkenes. Since a water molecule is eliminated from the alcohol molecule in the presence of an acid, this reaction is known as acidic dehydration of alcohols. Like alkyl halides, dehydration of alcohols also also follows saytzeff rule. Ethene is prepared by dehydration of ethyl alcohol with conc H2SO4 at 440K. A mixture of ethanol and conc H2SO4 in the ratio of 1:2 by volume is added from a dropping funnel into a round bottom flask containing anhydrous Al2(SO4)3 and sand in whichAl2(SO4)3 catalyzes the reaction whereas sand is used to avoid frothing during the process. Electrolysis of sodium or potassium salts of saturated dicarboxylic acid gives alkenes. 1) Physical state ,colour, smell : The first three members of the family i.e. ethene, propene and butene are colourless gases, the next 14 members are liquid while the higher ones are solids. Ethene which has a pleasant smell ,all other alkenes are colourless and odourless gases. 2) Solubility: They are insoluble in water ,but are fairly soluble in non-polar solvents such as benzene, petroleum, ether. 3) Boiling point: Their boiling point increases regularly with increase in molecular masses. The boiling points generally increases by 20-30 K for the addition of each CH2 group to the chain.Straight chain alkenes have higher boiling point than isomeric branched chain alkenes. Alkenes are characterized by the presence of a double bond which consists of a strong C-C, σ-bond and a weak C-C π-bond. The π-electrons form an electron cloud which lies above and below the plane of σ-bonded carbon atoms. These π-electrons are more exposed and hence are less tightly held between the two carbon atoms. Since the electrons are negatively charged particles ,therefore, the π-electron attract the electrophiles and repel nucleophiles. 1) In electrophilic substitution reaction, one σ C-H bond is broken and a new σ-bond between one of the doubly bonded carbon atoms and the electrophile is formed. Since the bond energies of the σ C-H bond broken and new σ C-X bond formed are not much different, therefore, electrophilic substitution reactions are not accompanied by large energy changes. 2) In electrophilic addition reaction, one weak π-bond is broken and two strong bonds are formed. Electrophilic addition reactions are energetically more favourable than electrophilic substitution reaction. Bromine molecule itself is non-polar but when it comes close to an ethene molecule, the π-electrons of double bond begin to repel the electron pair holding the two bromine atoms together in the bromine molecule.As a result, bromine molecule gets polarized. The positive end of this bromine dipole behaves as an electrophile and is attracted by the π-electrons of the ethene molecule to form a π-complex which subsequently gives the carbocations and the bromide ion.This step is slow and hence is the rate determining step of the reaction. The carbocation formed being a reactive chemical species immediately undergoes nucleophilic attack by the bromide ion present in the solution forming the addition product.This step is fast and hence deos not affect the rate of the reaction. 1) Addition of dihydrogen: Addition of dihydrogen to unsaturated hydrocarbons in presence of a catalyst is called catalytic hydrogenation. Alkenes readily add dihydrogen in presence of Raney nickel , platinum, palladium as catalyst at room temperature or ordinary nickel at 523-573 K to form alkanes. 2) Addition of halogens: Halogens such as chlorine and bromine readily readily add to alkene to form 1,2-dihaloalaknes. During the addition of bromine to alkene, the orange red colour of bromine is discharged since the dibromine formed is colourless.This is a test for unsaturation in organic compounds. 3) Addition of halogen halide : Alkenes react with halogen halide to form monohaloalkanes called alkyl halide. The order of reactivity of halogen halide in this reaction is : HI> HBr>HCl.This order of reactivity can be explained on the basis of bond dissociation energies of hydrogen halides; lower the bond dissociation energy, more reactive is the halogen halide. When the alkene is unsymmetrical , two products are possible. For example: The addition of HBr to propene in the dark and in the absence of peroxides , can give two products.It has been found that under these conditions, the major product is 2-bromopropane and the minor product is 1-bromopropane. The addition of unsymmetrical reagents such as HX, H2O , HOX to unsymmetrical alkenes occurs in such a way that the negative part of the adding molecule goes to that carbon atom of the double bond which carries lesser number of hydrogen atoms. tert-butyl chloride is the major product. The addition of halogen halide to alkene is an electrophilic addition reaction.Thus , during the addition of HBr to propene, the first step involves the addition of proton.This addition can occur in 2 ways. 1) If the proton adds on the terminal carbon atom of the double bond, a 2° carbocation is formed. 2) If the proton adds on the middle carbon atom, a 1° carbocation is produced. 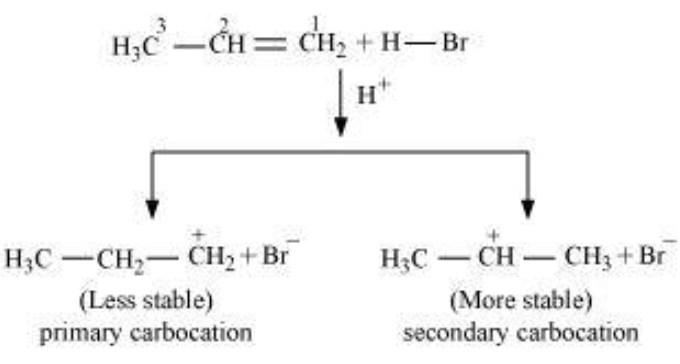 Since a 2° carbocation is more stable than 1° carbocation therefore, major product is 2-Bromopropane. In the presence of peroxides such as benzoyl peroxide , the addition of HBr to unsymmetrical alkenes take place contrary to Markovnikov’s rule way.This is known as peroxide effect or Kharasch effect. The addition of HBr to alkene in the presence of peroxide occurs by free radical mechanism. Chlorine and bromine in the presence of water readily add to alkene to from halohydrins. The addition of the elements oh hypohalous acid take place according to Markovnikov’s rule. Cold conc H2SO4 adds to alkenes to form alkyl hydrogen sulphates.In case of unsymmetrical alkenes , addition occurs in accordance with Markovnikov’s rule. Alkyl hydrogen sulphates on boiling with water, undergo hydrolysis to produce alcohols. Overall two-step conversion of an alkene first into alkyl hydrogen sulphate followed by hydrolysis with boiling water to form alcohols is called indirect hydration of alcohols. Some reactive alkenes do add water in presence of mineral acids to form alcohols.The addition in accordance with Markovnikov’s rule. Alkenes burn in oxygen or air to from CO2 and H2O.This process is called combustion.All combustion are highly exothermic in nature. 2) Controlled oxidation with oxidising agents: Alkenes reacts with a number of oxidising agents to give different products. 1) Oxidation with oxygen: Alkenes react with O2 in presence of silver as catalyst to form epoxyalkanes or epoxides. a) With cold dilute neutral or alkaline KMnO4 : Because of the presence of π- bonds, alkenes are readily oxidised by cold dilute neutral or alkaline KMnO4 solution to give vicinal or 1,2-diols or 1,2-glycols while KMnO4 is itself reduced to MNO2. This reaction is called hydroxylation since during this process, two hydroxyl groups are added across the double bond. During this reaction , the pink colour of KMnO4 solution is discharged and a brown precipitate of manganese dioxide is obtained.This reaction , is therefore , used as a test for unsaturation under the name Baeyer’s test. b) Oxidation with hot KMnO4 solution: When an alkene is heated with hot KMnO4 solution, cleavage of the C=C bond occurs leading to the formation of carboxylic acid, ketones and carbon dioxide depending upon the nature of the alkene. With terminal alkenes , one of the product is always methanoic acid. With non- terminal alkenes , ketones or carboxylic acid or both of these product are obtained depending upon the nature of alkene. c) Oxidation with ozone: When ozone is passed through a solution of alkene in some inert solvent such as CH2Cl2, CHCl3, CCl4 at a low temperature, it oxidises alkene to ozonides. Ozonides are unstable and explosive compounds.Therefore, they are not usually isolated but are reduced, in situ, with zinc dust and water or H2/Pd to give aldehydes or ketones or a mixture of these depending upon the structure of the alkene. If the ozonides are decomposed only with water , the H2O2 produced during the reaction oxidises the initially formed aldehydes to the corresponding acids. This two-step conversion of an alkene into an ozonide followed by its reductive cleavage to yield carbonyl compound is called ozonolysis. Polymerization is a process in which a large number of simple molecule combine to form a big molecule.The simple molecule are called monomers while the big molecules is called a macromolecule or polymer. 1) Polymerization of ethene : When ethene is heated to 473 K under a pressure of 1500 atm and in presence of a trace of oxygen , it undergoes polymerization to from polythene. It is widely used as a packaging material and as insulation for electric wires and cables.It is also used for making squeeze bottles, refrigerator tray, pipes, radio and T.V. cabinets. 2) Polymerization of propene: Polypropene is prepared either by heating proplyene in presence of a trace of benzoyl peroxide as radical indicator or by Ziegler-Natta polymerization. It is harder and stronger than polythene and is used for making milk crates, plastic buckets, automotive moulding, seat covers, carpet fibres, ropes. 3) Polymerization of substituted ethenes: A number of polymers can be obtained by using substituted ethenes as monomers. Polyvinyl chloride is used for making plastic bottles, syringes, pipes , raincoats, records etc. Polyacrylnitrile is used for making orlon and Acrilan fibres used for making clothes, carpets and blankets. It is used for packing and for making toys and household goods. 1) Lower members of the family are used as fuels and illuminates. 2) Alkenes and substituted alkenes upon polymerization form a number of useful polymers such as polythene, PVC, teflon, orlon etc. 3) Ethene is employed for the preparation of ethyl alcohol and ethylene glycol. 4) Ethylene is used for artificial ripening of green fruits. 5) Ethylene is also used in oxygen ethylene flame for cutting and welding of metals. Author of this website, Mrs Shilpi Nagpal is MSc (Hons, Chemistry) and BSc (Hons, Chemistry) from Delhi University, B.Ed (I. P. University) and has many years of experience in teaching. She has started this educational website with the mindset of spreading Free Education to everyone.